I purchased this phone for my Mom for Christmas. She doesn't like phones, either. But she does like this one, because it looks great in her bedroom. Let’s see. How can I spin this to fit nicely in the junk drawer category? Well, I know there is an old cell phone battery in our junk drawer. I am not sure why we have it, but we have it. So, with just a few degrees of separation, I am going to begin my rant on telephones. 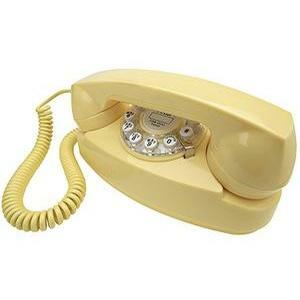 Though I am a fan of gadgets, and I love the look of vintage corded phones, I am not a fan of ringing telephones. Nor am I a fan of cell phones. All of you will quickly tell me why your cell phone is needed, and you will all do your best to convince me that you are the exception to the stereotype that many cell phone owners talk on their phone while driving, text while driving, talk while shopping, etc. Do I sound judgmental? My apologies. I merely have strong opinions about the telephone and cell phone, and I have stronger opinions about the conversations I overhear, as folks use their cell phones while in waiting rooms, grocery stores, etc. Again, I am certain you are not among the above mentioned cell phone users. You, like countless others, are the exception. Noted. I like to control things. For those of you who know me and are reading this, you will nod in agreement or perhaps smile a bit. This morning I have come to the conclusion that one reason I do not like the phone is due to the fact that I have no control over when it will ring. Moreover, if I have a phone call to make, I have no control over whether or not the person I am trying to reach is available. Grrrr. Stupid phone. This morning, my husband asked me if he could use/have the headpiece that came with my cell phone. *Gasp* Yes, I own a cell phone. I nodded to my husband and said, “Sure.” He then had to open the box, as the headpiece was still in the original box and unopened. My cell phone is a pay as you go plan. If I use it, I am charged $3.99 for the entire day (unlimited minutes). The reason I finally caved and purchased the cell phone was because I drove up on a man who had a bicycling accident. I was the first on the scene. Unfortunately, all I could do was talk with him and wait for someone else to arrive. I had no cell phone. I was unable to call for help. The bicyclist was OK. Someone did arrive, an ambulance was called and peace was restored to this man’s life. But I was shaken to the point that I went out an ordered a cell phone the next day. My hatred towards phones is still securely in place. I rarely – rarely – rarely – use my cell phone. And, thankfully, I have yet to use it for an emergency, which is the sole purpose I have it. Fact of the matter is, folks say they have the cell phone just in case, but the frequency of those ‘just in case’ moments are few and far in between. The majority reason people use their cell phone is for convenience and fun. We live in a very instant-gratification society. We have a thought we want to share with someone – or a question we want to have answered – we use our cell phone and take care of it instantly (provided the phone is answered, of course). With all this griping, I want you to know I appreciate the benefits of phones. Thanks to the phone, I am able to stay in touch with my friend in Maryland. (Thanks to Facebook, I am able to stay in touch with my friend in FL. I think she hates the phone, too. Sha’woo!) And, thanks to the phone, I get awesome messages from one of my Aunts right around my birthday. The traditional phone and the cell phone have purpose. I am thankful for the technology that comes with phones. But, I think I am most thankful for the mute/ignore button, as well as the answering machine. Call me!